Read more about Dining with Virginia at the MLA. Date: Saturday, Jan. 25, 2 p.m.
Sarah Ruhl’s stage version of Orlando, Woolf’s fantasy about a man who wakes up to find he has changed into a woman. Date: April 5, 2014, 8:30 a.m. – 4 p.m. Hosted by Institute of English Studies, Senate House, University of London, for the Virginia Woolf Society of Great Britain. 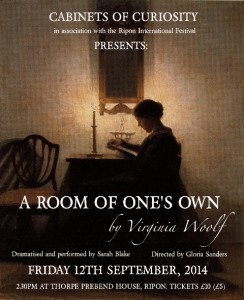 The conference (all welcome) will follow the Virgina Woolf Society AGM (VWS of Great Britain Members only). Location: University of Sussex . Restorations and Transformations at 1 p.m. on May 16, which discusses recent projects at Charleston to to restore and upgrade barns and hidden courtyards while maintaining the site’s history and special atmosphere. 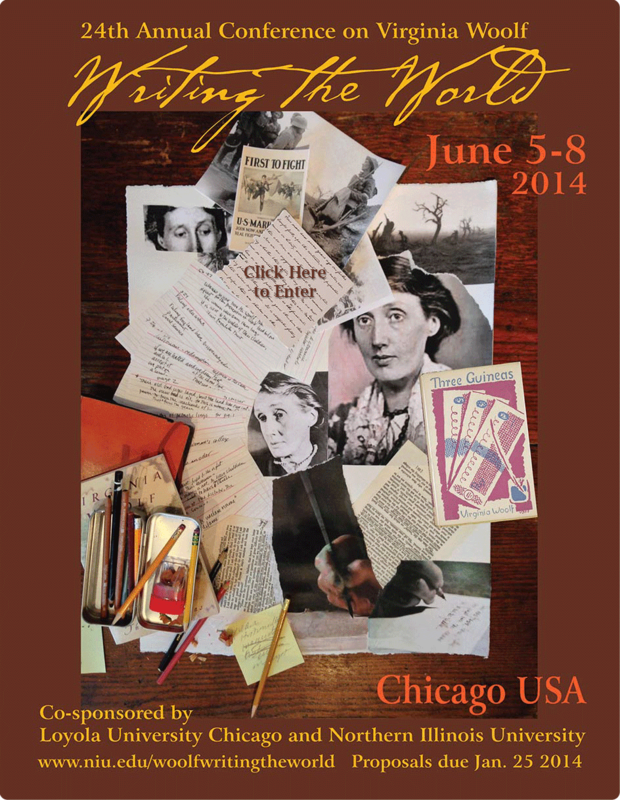 Eileen Atkins’ 25th anniversary performance of A Room of One’s Own at 7:30 p.m. on May 25. Odes to Virginia Woolf with novelists Alison Macleod, author of Unexploded, and Maggie Gee, author of Virginia Woolf in Manhattan, at noon on May 26. They will discuss oblique and overt ways of referencing literary forebears with Frances Spalding, curator of the forthcoming Virginia Woolf Exhibition at the National Portrait Gallery. Get the full schedule of events. Location: Loyola University’s Lakeshore Campus, Chicago, Illinois, U.S.A.
Co-sponsors: Northern Illinois University and Loyola University Chicago. Call for Papers: Proposals for papers, panels, roundtables and workshops on any aspect of the conference theme: the centenary of WWI; peace, justice, war, and violence; writing as world creation; Woolf as a world writer; the globalization of Woolf studies; or other topics of your choosing.